Mall Advertising - Tiffany Outdoor Inc. Malls evolve with consumer needs and reflect America's communities. 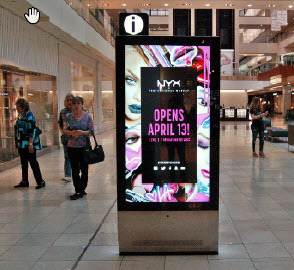 With static or digital mall signage, you can reach 85% of the local community. Mall advertising offers audience targeting on a hyper local scale. On average, consumers visit the mall 3-4 times per month and spend 3 hours per visit. And your advertisement can reach a customer just steps from the point of purchase!